This super side dish is quick and easy to make and it’s packed with standout veggies. Think you don’t like Brussels sprouts? It’s time to give them a second chance—they are absolutely delicious in this recipe, roasted along side sweet butternut squash, crunchy pecans, and juicy pomegranate seeds. 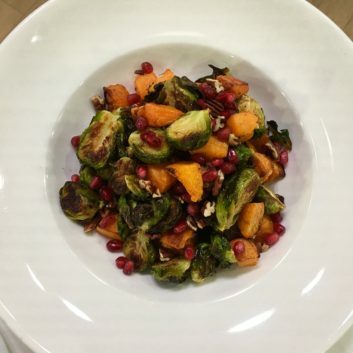 In a large mixing bowl or zip-top bag, add the Brussels sprouts, butternut squash and oil. Mix well. Spread the vegetables out on a large baking sheet or two medium sheets. Mist tops with olive oil cooking spray so everything is nicely coated. Sprinkle on the salt, pepper and garlic. Roast for 10 minutes, toss them around and sprinkle on pecans. Place back in the oven and roast for an additional 15 to 20 minutes (depending upon on how soft you want the veggies). Season with additional salt and pepper, and garnish with pomegranate seeds (or dried fruit, like cranberries or cherries).